Set on a secluded cove of white sand beach at the edge of the Caribbean Sea, surrounded by tropical gardens and rainforest, BodyHoliday Saint Lucia is the ultimate getaway for body and mind. Recognized as one of the finest destination resorts and centre of well-being, there couldn’t be a more idyllic corner of the world to escape to. But what makes this vacation truly idyllic is it’s designed by you. Whatever you choose, and anything you wish, can be planned before you arrive. At BodyHoliday, we help design how you spend your days with a personalized list of body treatments and activities or a customized programme tailored for you. We arrange everything beforehand, and we also offer to follow-up after you leave because a renewed sense of well-being is not only what we want you to experience here, it’s what we want you to take home. To us, the perfect holiday offers more than an island getaway but a return to wellness. At BodyHoliday, it is what our philosophy is based on, and what our Wellness Centre is built for. Recognised as one of the world’s finest destination spas, the Wellness Centre is a true sanctuary, where every soothing treatment is designed to help you unwind, recharge and rediscover a sense of well-being. From time-honoured massages and therapies for ultimate relaxation to state-of-the-art programmes for restoring optimal health, there is an endless list of luxuries to indulge in. Every day of your stay at BodyHoliday is a day of pampering. Complimentary daily spa treatments are part of the experience. Before you arrive, we can help you plan a personalised schedule of spa activities–from our complimentary range of treatments as well as our special therapies–to ensure a vacation made for wellness is also tailor-made for you. BodyHoliday is proud to offer retreat programmes in addition to our wellness holidays. Participants can select a week-long retreat, based on yoga, weight loss mindfulness and Detox whilst staying at BodyHoliday’s luxury villa “FIREFLY”. This beautiful Caribbean residence overlooks the resort and enables retreat guests to both enjoy the camaraderie and seclusion afforded by Firefly and join in resort activities in their free time. The warmth and beauty of Saint Lucia, combined with a first-class retreat program awaits you at the World’s leading holiday of well-being. 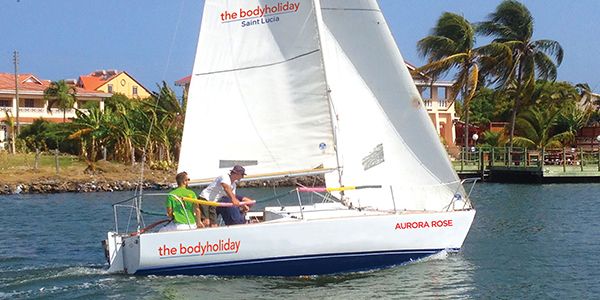 BodyHoliday Saint Lucia is the ultimate rejuvenating vacation. Time spent here is designed to make you feel renewed and invigorated, healthy and strong, calm and centred, and completely comfortable in your own skin–which is why our all-inclusive resort is designed around every imaginable fitness class for mind and body, and every manner of sport on land and sea. Whether you want to experiment with something new, explore an island adventure, push your limits, perfect your game, continue your favourite practice or simply learn to play, you’ll find the activity here as well as the expert teachers and sports pros to coach and guide you. Before you arrive, you can customise your own schedule from our endless list of activities and fitness classes and specialised sports programmes. At BodyHoliday, we not only help you create a personal programme to get you started on a new exercise plan, we also offer to follow up after you leave to help you meet your goals.